Broken Shore is reminiscent of Tanaan Jungle and Timeless Isle, but its content is unlocked more gradually. The zone also contains the Tomb of Sargeras raid and the Cathedral of Eternal Night dungeon. After speaking to Archmage Khadgar at Krasus Landing in Dalaran, you will begin a scenario that serves as a prelude to the Armies of Legionfall and the Broken Shore. Once the scenario is completed, you will unlock Broken Shore World Quests and gain initial reputation with the Armies of Legionfall. With Patch 7.2, Nethershards (the currency of the Legion pre-patch) are making a comeback. They are used to purchase various items from the the faction's quartermaster. Nethershards can be earned mostly from Broken Shore world quests, invasions, the Sentinax, or looted from rare elites and containers on the Broken Shore. Deliverance Point will be your main foothold, where you will contribute Legionfall War Supplies (obtained mainly from Broken Shore World Quests and rare Elites) by batches of 100 in order to construct structures that grant various perks (including activating new content). Contributions are a cross-faction, region-wide effort. As you can see, there are 3 buildings (Mage Tower, Command Center, and Nether Disruptor). Each building has a permanent perk (i.e., a perk that is enabled for everyone) and a secondary random perk that changes every time the building is rebuilt. In order to benefit from the perks, players need to speak with Commander Chambers every time a building is rebuilt. Once a building is completed, the Legion will periodically attack it, eventually destroying it. Perks are disabled when the buildings are destroyed. There is a 1-day cooldown period before a destroyed building can be rebuilt. The Deliverance Point building accumulation rate has been increased for all regions. The intended result is for buildings to complete at approximately the same rate as they did before Patch 7.3. (Source). The permanent perk of the Mage Tower is Fel Treasures. It activates the following content: Artifact Challenges, Veiled Wyrmtongue Chests, and Portal Network. Artifact Challenges: The Council of Six provide access to a series of unique challenges, allowing worthy heroes to test their might and skill. This is single-player content that allows you to test out your skills against a mighty opponent. If you succeed, you will unlock new Artifact appearances for your specialization. It costs Nethershards to purchase additional chances at the encounter. There is a total of 7 challenges per specialization. Veiled Wyrmtongue Chests: The power of the Mage Tower pulses across the Broken Shore, revealing the lucrative Veiled Wyrmtongue Chests. Veiled Wyrmtongue Caches are shared containers that spawn at random locations whenever the Mage Tower is up (not to be confused with Curious Wyrmtongue Caches). Portal Network: The Kirin Tor provide access to portals which can be used to move quickly around the Broken Isles. Inside the Mage Tower, you will find portals to move between zones across the Broken Isles (Azsuna, Highmountain, Val'sharah, Stormheim). Knowledgeable — When you loot an item which grants Artifact Power in a Raid or Dungeon, there is a chance that you will receive a bonus Artifact Power token. Light As a Feather — You are able to waterwalk while mounted. Power Overwhelming — Completing World Quests has a chance to grant an extra Artifact Power token. Reputable — Increases reputation gains with the Armies of Legionfall by 30%. The permanent perk of the Command Center is Forces of the Order. It activates the following content: Cathedral World Quests, Legionfall Reinforcements, and Challenge Mission. Cathedral World Quests: With command established, efforts can be focused on assaulting the Cathedral of Eternal Night. This unlocks Cathedral of Eternal Night Dungeon World Quests. Legionfall Reinforcements: Commanders of Legionfall are provided with additional support throughout the Broken Isles. You will gain assistance of the Armies of Legionfall while engaging in content on the Broken Shore, such as Demon Hunters coming from the sky casting Fel Barrage. Challenge Mission: Send worthy champions on a challenging but lucrative mission deep into the heart of the Broken Shore. 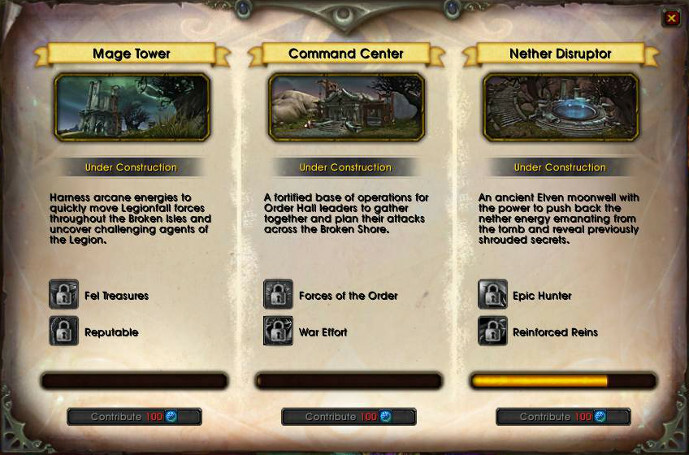 These are special Order Hall missions for your followers, with higher than average rewards. Heavily Augmented — Completing World Quests has a chance to grant you a Defiled Augment Rune. War Effort — Chance when earning Legionfall War Supplies to get bonus Legionfall War Supplies. Well Prepared — Increases all primary stats by 10% while in the Broken Shore. Worthy Champions — Increases your chances to get a piece of Legendary Follower Equipment. The permanent perk of the Command Center is Epic Hunter. It activates the following content: World Bosses, Unstable Nether Portals, and Armorcrafter Commendations. World Bosses: The energy from the Nether Disruptor draws the most powerful enemies to the Broken Shore. Unlocks four new world bosses that drop item level 900+ loot. The bosses will not spawn unless the Nether Disruptor is active. The bosses are Apocron, Brutallus, Malificus, and Si'vash. Unstable Nether Portals: The Nether Disruptor's activation causes Unstable Nether Portals to appear across the Broken Shore. Activate them to summon dangerous foes. You will need a Nether Portal Disruptor to activate the portals. You can buy it for 250 Nethershards from Warmage Kath'leen. The Elites summoned drop better than average loot. Armorcrafter Commendations: Artisans of the highest level will receive commendations for their efforts, allowing them to craft the most Legendary of items. This allows you to speak to Eliezer Hammerbeard to start quest lines that end up teaching you how to craft the new legendary crafted items for your profession(s). Fate Smiles Upon You — If you fail your bonus roll on the Broken Isles, there is a chance that you will have your Seal of Broken Fate refunded. Netherstorm — Chance when earning Nethershards to get bonus Nethershards. Reinforced Reins — Allows you to interact with objects while mounted. Seal Your Fate — Each day the Nether Disruptor is active, you can return to the Broken Shore to complete a quest that grants you a free Seal of Broken Fate (that can go beyond the standard limit of 3 Seals per week). Lingering Wyrmtongue Essence for 50,000 Nethershards. In Patch 7.3, Thaumaturge Vashreen moved to Argus and you can purchase new Relinquished items with a base item level of 910 for Veiled Argunite. More information can be found in our Argussian Reach guide. Before Patch 7.3, you were able to purchase Relinquished Tokens from Thaumaturge Vashreen, at a cost of 5,000 Nethershards per token. These tokens had a chance to contain a Legendary item appropriate for your loot specialization, with a base item level of 880. These tokens are the World of Warcraft equivalent of Kadala gambling in Diablo 3. Leatherworking: The Sentinel's Eternal Refuge and Vigilance Perch. Note that they do not reset or influence bad luck protection in any way. If you have Tailoring, Leatherworking, or Blacksmithing maxed out when the Nether Disruptor is built, you will receive a Armorcrafter's Commendation from The Nether Disruptor quest. With this item in your bags, you can go and speak to Eliezer Hammerbeard at Deliverance Point to start the Fashion History and a Philosophy of Style quest, which serves as an introductory quest for all crafted legendary quests. From there on, you will be given different quests to complete, depending on your profession, before you can craft the new crafted legendary items. Crafting a legendary item consumes a Nethershard Essence, which you can buy from Warmage Kath'leen for 8,000 Nethershards. The Sentinax is a Legion battleship cruising the Broken Shore (it periodically changes its location) and attacking the area beneath it. 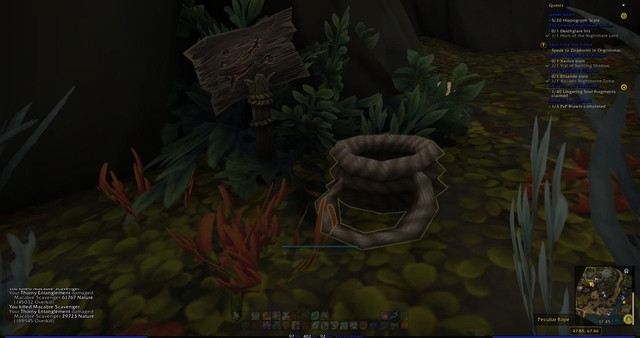 Enemies beneath the Sentinax have a chance to drop beacons that are used to cause the Sentinax to open portals, which spawn more difficult creatures. When killed, the creatures drop Nethershards, crafting materials and even more powerful beacons that can be used to summon more challenging foes and provide better loot. Hence, several types of beacons can be dropped with increasing difficulty. Sentinax Beacon of the Bloodstrike, which causes the Sentinax to fire a Bloodstrike at your current location. It deals 160% of your maximum Health as Chaos damage over 4 seconds, unearthing Blood of Sargeras. You need to survive through the damage in order to be able to collect it (personal cooldowns are advised). We counted 10 achievements linked to the Broken Shore. They are all self-explanatory, so we simply list them here. Explore Broken Shore — Explore the Broken Shore, revealing the covered areas of the world map. Terrors of the Shore — Defeat all 4 of the following monstrous creatures in Broken Shore. Bringing Home the Beacon — Use a Sentinax beacon in each of the following areas. Naxt Victim — Slay each of the demonic lieutenants that can be summoned from the Sentinax in Broken Shore. A Magic Contribution — Contribute to the Mage Tower on the Broken Shore 5 times. A Magnificent Contribution — Contribute to the Mage Tower on the Broken Shore 50 times. Take Command — Contribute to the Command Center on the Broken Shore 5 times. Assume Command — Contribute to the Command Center on the Broken Shore 50 times. Disrupting the Nether — Contribute to the Nether Disruptor on the Broken Shore 5 times. It'll Nether Happen — Contribute to the Nether Disruptor on the Broken Shore 50 times. 09 Sep. 2017: The Deliverance Point building accumulation has been increased. 30 Aug. 2017: Updated for Patch 7.3 with the relocation of Vashreen and details about completion rates of structures. 21 Apr. 2017: Several updates to clarify. 27 Mar. 2017: Guide added.